Originally appeared on the VESSEL music site. Phaedra the tragic mythological love-torn, and cursed wife of Theseus has lent herself to many plays, poetic proses, operas and even an asteroid. This rebuked siren from Greek tragedy is immortalised for a new epoch as part of the West Berlin synthesizer group’s re-textured sweeping experiments. Covering the entirety of side one, on this their first LP for Virgin, Phaedra is like an acid-trance choral eulogy of incipient multilayer motifs, and arpeggiator modulations. The sounds of a ghost ships switchboard interlaced with twisting metallic reverb both gravitate and loom over a meandering pan-European work-out on this improvised track, which unintentionally, but rather pleasingly and to great effect, fluctuated in tone and tempo- atmospheric changes played havoc with the analog equipment. Edgar Froese and his ever rotating line-up of fellow free-thinking cohorts had moved on from their so-called ‘Pink Period’ on the German Ohr label, to a more transcendental and ambient approach on the burgeoning Virgin imprint. 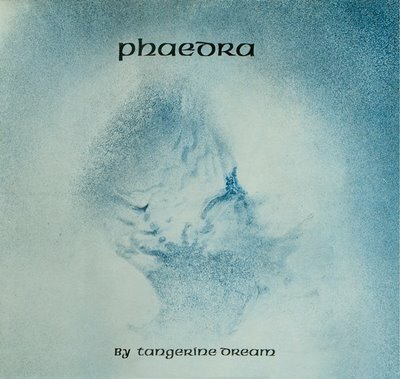 Phase three in the Tangerine Dream life-cycle, saw them showered with, almost, unlimited funds and full use of the famous Manor Studios in Oxford – where fellow compatriots Faust recorded their IV album, a few months before. Flanking Froese on this adventure were the ex-Agitation Free drummer Chris Franke, and Peter Baumann; who’d already left the trio once before, returning just in time to record this musical suite. Phaedra would be an album of firsts for the band with the introduction and use of sequencers and the MOOG. Franke would adopt DR.Robert Moog’s invention as a substitute to the bass guitar on the visionary soundscape ‘Mysterious Semblance At The Stand Of Nightmares’ – surely the catalyst and influence behind Bowie’s ‘Warszawa’. The polyphonic Mellotron, used to elegiac effect on the very same track, is tenderly coaxed and teased by Froese, whilst the VCS 3′s battleship pin board decked oscillation generator glides and bubbles throughout the four musical vistas of heavenly orchestrated electronica. Baumann explores the use of tape-echo and filtered effected flute on his own paean composed passage, ‘Sequent C’; a short wistful and haunting soundtrack to some imagined eastern elegy. Released simultaneously in both Germany and the UK on the cusp of 1974, this album more than any ever by the Dream team cemented their reputation. With scant publicity and sporadic underground radio play, it sold in excess of 100,000 copies overseas and entered the top twenty album charts in Blighty, changing the fortunes of the Virgin label forever. However these prophets failed to drum-up the same exultation and adulation back in their homeland, barely shifting 6,ooo records. Considered a sea-change in style and dynamics; a marked departure from their classic ‘Alpha Centauri’, this New Age themed cantata pitches itself somewhere between pantheism, mythology and a nebula traversing flight.